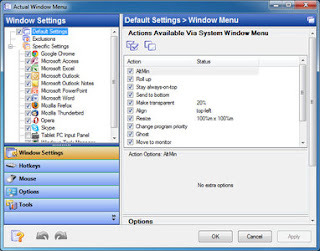 SAGITA COM - Actual Window Menu adalah aplikasi yang kompleks yang menyediakan pengguna tingkat lanjut dengan cara-cara alternatif mengatur dan mengelola window. Instalasi, serta penggunaan program, sangat mudah dan tidak memerlukan banyak waktu. Perintah-perintah baru sangat mudah digunakan seperti Pindah umum / Ukuran / Minimalkan / Tutup, dan secara signifikan meningkatkan kemampuan manajemen window. The 'Minimize to Tray' feature lets you save taskbar space while providing access to minimized applications via the system tray icons. Make your own taskbar less cluttered and more handy! The 'Make Transparent' feature lets you apply transparency effect from 0% (fully transparent) to 100% (solid) rate to any program in Windows 2000/XP. The 'Stay on Top' feature helps you place the selected windows on top of other ones, so that it were always accessible and couldn't be hidden by other windows. Don't let these windows annoy you when you busy! The 'Resize Window' feature allows you to set the size of any selected application window to have it always opened at the size you want. You can choose any Default Window Size from the list which includes exact window sizes in pixels (e.g. 640 x 480; 800 x 600; 1024 x 768) or in percents from the desktop size (e.g. 100% x 100%; 50% x 50%). Moreover you can set the width and height of any window on your own by using Custom Window Size option. lama nggak singgah kemari sob,apa kabarnya?mudah2n sehat ya.terima kasih sudah berbagi. Alhamdulillah baik kak, terima kasih kembali telah mampir kemari.